Whether we experience a mild or frigid winter, it’s the time of year when many gardeners get “twitchy” to do something with their gardens! But for those who have no space or limited space gardening in “traditional rows” is not an option! In this article, I want to encourage readers with sparse soil options to consider gardening with some of the following “alternative” small gardening practices. Container gardening is a popular small gardening “alternative” and works wonderfully for folks in apartments or if you have a porch or patio and want to have your vegetables as close to the house as possible. Almost any kind of container is fair game when growing vegetables, as long as there are drainage holes in the bottom. Many folks use traditional containers such as a window box or a decorative pot made of clay or plastic. 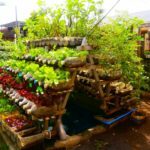 Over the years, I’ve seen watering cans, bathtubs, wheelbarrows, children’s wagons and other such items repurposed into container gardens that can be quaint and quite imaginative! Always remember to drill holes in the bottom to ensure proper drainage and avoid potential plant root rot from inside. When choosing the type of soil for your containers, consider using a potting mix rather than top soil. Be prepared to monitor your plants closely and water more frequently as quite often the soil dries out quicker in containers than soil in the ground. Eventually you will water everyday once the roots have grown throughout the container and the temperatures are consistently warmer. Another interesting method many gardeners have inquired about is straw bale gardening. People wonder how you could possibly grow anything in a straw bale, but the process is pretty straight forward. First off, you’ll need bales that have begun to decompose in the center, so use either year-old bales, or condition the bales prior to planting by watering and adding a heavy nitrogen fertilizer. It takes about two weeks to properly condition the bales and then you’ll be ready to plant. If starting seeds, you’ll need to add a few trowels of compost to the center of the bale before sowing. Not all plants are ideal for straw bale gardening, but strawberries, tomatoes, peppers, squash, pumpkins, cucumbers, watermelon, and zucchini work quite well. Hay bales can also be used for the same purpose, but be aware that hay bales will generate a lot of weeds, whereas straw bales are generally less so. Straw bales require more water and fertilizer than traditional gardens, but are a good “alternative” if you have soil with poor fertility, disease and or limited space. Another practice that has been increasing in popularity is square foot gardening. Square foot gardening is a system developed by gardener and author Mel Bartholemew, and is described at length in his books Square Foot Gardening and All New Square Foot Gardening. Square foot gardening is a method where vegetables are grown in one-foot by one-foot squares within a raised bed. Gardeners arrange their beds in multiple ways, from a single square to as many as sixteen squares arranged four by four. Within each square, you can grow desired vegetables with the spacing and plant density in each square varying depending on the mature size of the vegetable within that square. Large plants, like tomatoes, peppers and broccoli would have just a single plant per square, allowing room for each plant to grow to full size. Smaller plants like beets can be planted up to 16 plants per square, while plants such as carrots can have 32 per square. As you can see, the concept behind square foot gardening is to maximize available space, as opposed to “open” spaces between the rows in traditional row gardens. Always remember to be smart and creative when picking which vegetables to grow! Don’t be afraid to try something new! Think vertical as a means to expand your garden as in the case of stringing up cucumbers. Consider growing both cool and warm season vegetables, utilize succession planting and tap into the benefits of low tunnels.